The C&N Troph�e Bailli du Suffren regatta, now in its 14th Edition, is one of those exclusive events where the charm and character of the participating classic yachts blend gracefully with the natural beauty, cultural heritage, passion, glamour and style of the host destinations. First held in 2002 the C&N Troph�e Bailli de Suffren is known as "The Mediterranean's Most Beautiful Yacht Race" not only for the beauty of the very special yachts taking part but also for its unique "gentlemen's race spirit" and the exotic ports marking the race course - from Saint-Tropez France to Valletta with festive ports of call at Porto Rotondo in Sardinia and Palermo Sicily. The longest off-shore race - 600 miles - for classic yachts over 11-metres actually takes its name from a famous 18th century French admiral, Pierre Andr� de Suffren de Saint-Tropez, who spent his early career in Malta and while here received the title of "Bailli de Suffren" from the Knights of St John. Undoubtedly the Event serves also to revive and strengthen historic and modern links between Birgu, the old Knights fortified city on the south side of the Grand Harbour, and Saint Tropez the hometown of the French Admiral. Today with Camper & Nicholsons Marinas as headline sponsor the association between a famous classic yachts race and one of the oldest and most prestigious names in the global yachting industry gives the Event a significant standing and a strong exposure possibility. Excitement and competition further enhance the spirit of the Event - Last year after 134 hours of racing the 1938 cutter Amadour owned and skippered by Tom Van Der Bruggen triumphed over the 2013 winner Lelantina of Willy Marrecau by the narrowest of margins, just 0.09 points - between 242.27 and 242.18. The closeness of the competition was also reflected in the elapsed times, with Amadour covering the course in a total of 133 hours 56 minutes and Lelantina less than 30 minutes behind. The Mediterranean, particularly its western region, is recognised as the most famous and popular cruising ground in the world for large luxury super yachts. From the eighties the sailing rallies for Classic Yachts in the Mediterranean grew steadily where today between May to October various Mediterranean dazzling hotbeds present opportunities to these sea pin-ups to gather, enjoy their meetings - both at sea and ashore - and be enjoyed by crowds of enthusiastic onlookers. Events like the R�gates Royales in Cannes, looked upon as the Queen of all such events, Les Voiles d'Antibes in Antibes, Le Vele d'Epoca di Imperia in the Ligurian Sea, the Panerai Classic Yachts Challenge which brings together Cannes, Antibes and Imperia, Barcelona Puig Vela Clasica, the Vele d'Epoca at Naples, the Argentario Sailing Week, and the Barcolana Classic in Trieste, events where the charm and character of these classic yachts blend gracefully with the natural beauty, cultural heritage, passion, glamour and style of the host destinations. 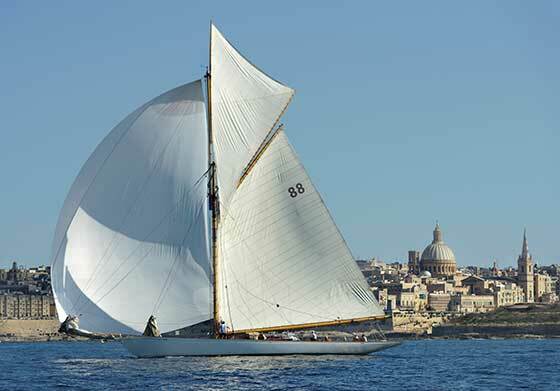 In such an alluring calendar of �Classic' sailing one also finds ingrained Malta's C&N Troph�e Bailli de Suffren. While the overall honour of the C&N Troph�e Bailli du Suffren is the prestigious Sword of Honour of Admiral Satan - for Pierre Andr� was known by his sailors and his enemies (particularly the British) as Admiral Satan - competing yachts have an award to aim for on each of the three legs of the Event. The winner of the first 193 nautical mile leg from Saint-Tropez to Porto Rotondo gets the La Coppa dei Quattro Mori; for the second 230 nautical mile leg from Porto Rotondo to Trapani there is the La Coppa dei Gattopardi and victory in the final 169 nautical mile leg from Trapani to Grand Harbour Marina earns The Corsairs' Cup. The 2015 C&N Troph�e Bailli de Suffren racing fleet set sail from the Mole J. R�veille, Saint-Tropez in France on Saturday 27 June and is scheduled to make the Grand Harbour Marina finish line on Tuesday 7th June. The Prize-giving presentation will be held over the Knight Corsairs Dinner at the Maritime Museum in Birgu on Wednesday 8th July. An Organising Authority made up of yacht clubs in the host ports namely the Soci�t� Nautique de Saint-Tropez, the Yacht Club Porto Rotondo and the Royal Malta Yacht Club promotes the Race which is coordinated by the Marenostrum Racing Club of Saint-Tropez.